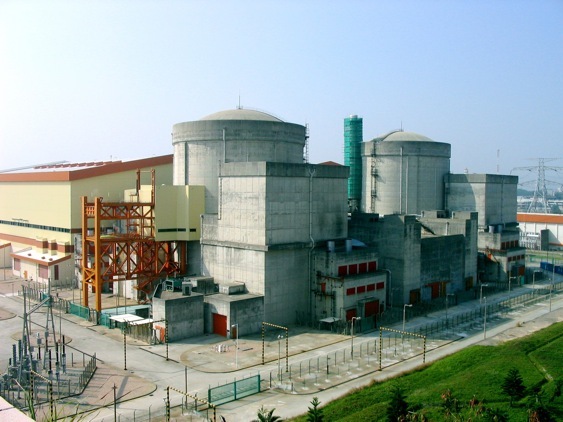 The Guangdong Daya Bay nuclear power station consists of two generating units generating a gross power output of 984 MW and a net power output of 944 MW, at a frequency of 50 Hz. As the NSS thermal power output is listed at 2905 MWt, this would imply an efficiency (using the net power output value of 944 MWe) of 3.25%. There is a 72.4 tons-heavy metal inventory of the enriched uranium dioxide fuel, in 157 assemblies. The assemblies are an AFA type using Zircaloy 4 as the jacket material for the fuel. Zircaloy-4 is by weight 98.23% zirconium with 1.45% tin, 0.21% iron, 0.1% chromium and 0.01% hafnium. The other elements are necessary to help prevent corrosion of the jacket material, and most of the hafnium naturally present in commercial zirconium (1%-5%) has been removed as it has a neutron absorption cross-section of over 600 times that of pure Zr. The reactor vessel design is by Framatome, a French company owned by Areva and Siemens, with subsidiaries in Germany and the US. The initial percentage values of U-235 of the initial core are listed as 1.8%, 2.4% and 3.1%. Every refueling (which occurs just under once a year on average), 3.25% of the core is reloaded. It takes three fuel cycles before full burnup. The reactor vessel is a cylinder 13.173 meters high with a 3.99 meter inner diameter. The walls are 200 mm thick, and are made of 16 MND5, which corresponds to the ASME code SA-508 Class 3, or low-carbon steel. The vessel itself is contained within a cylindrical container, held at a pressure of 5.2 bar. The core is cooled by water kept at 155 bar. A total of 68520 tons per hour of water flows vthrough the reactor, heated from 293 °C (at the core inlet) to 327 °C (at the core outlet). The primary pump is manufactured by Jeumont Schneider, a wholly owned subsidiary of Framatome (which is listed as the manufacturer of the steam generator). The turbine generator is a product of GEC (now known as Alstom), also a French company with an American representative in Windsor, Vermont. The maximum rating for the generator is 984 MWe, at a speed of 3000 rpm. It itself is cooled by seawater at a temperature 23 °C. 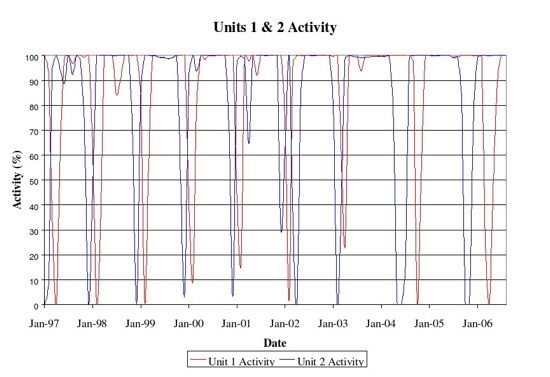 The availability of Unit 1 and Unit 2 over a period from January 1997 to August 2006 is plotted as a percentage versus time (in months). The sharp dips correspond to periods during which the reactor was shut down for a planned refueling and overhaul. There are however two dates of note. On 27 March 2002 Unit 2 underwent an outage to maintain conventional island equipment, which lasted until 5 May 2002. In May 2004 Unit 2 also experienced an extended shutdown during one of the routine refueling operations, due to an equipment problem during outage. The average efficiency of each unit over each year was provided. The average over the entire eight-plus year period was calculated with a simple mean (appropriately weighting the incomplete 2006 data). The graphical representations of the efficiency over time are on the following plots.